Lancaster took a four-point lead late in the fourth quarter and, believe it or not, fans sighed in relief. Until then, the Red Devils and Indians had matched shot-for-shot with 11 ties in the first 27 minutes of Monday night’s varsity boys basketball game at LHS. Lancaster went on a 13-0 run over a two minute span to beat Northumberland, 77-61. After spotting Northumberland five points to start, Lancaster took a 25-20 lead to end a high-scoring first quarter. That was the biggest lead for either team until the final four minutes of the game. The Indians, behind 18 first-half points from Delvin Palmer, led 40-38 at the break. But the two teams were locked at 50 each to end the third. 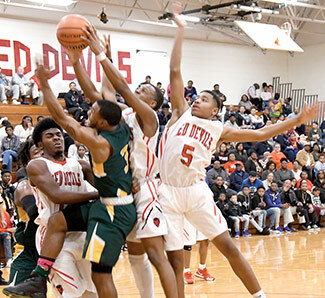 The Devils took a 58-54 lead with 4:57 to play then exploded for another 11 unanswered, including a dunk by BJ Lee that brought the crowd to its feet and a midcourt steal and lay-in by Jason Curry. TJ Frisby capped the run with a pair of foul shots for a 69-54 Lancaster lead with 2:25 to go to put the game out of reach. Curry came off the bench to score a game-high 18 points and record four steals for Lancaster. Lee turned in a double-double performance for LHS with 17 points and 13 rebounds. He also had four blocked shots in the first half.